Get free advice and estimates from shower door and enclosure contractors in your city. Showers are an integral part of most bathrooms, raising property values and increasing the function of the room. Many homeowners eventually decide to have a shower door installed, rather than a curtain, to help complete the room. And while there are many configurations and styles of shower doors, they generally fall into two types – framed and frameless glass. Both have positive and negative attributes to consider. We will outline these below so that you can make a more informed decision for your bathroom. Both framed and frameless shower doors are typically made of tempered glass, which may be treated for easy cleaning. Framed doors are made of thinner glass because the frame supports the door. The frame itself is usually made of aluminum and may be powder-coated in a variety of colors and finishes. The frame may be smooth or textured, and the glass is sealed into the frame to prevent leaks. Frameless doors are made of the same tempered glass but have a much thicker pane because there is no supporting frame. Clips, hinges 1, and door pulls are set into the glass and are caulked 2 at the edges and corners with a thick silicone to seal the glass. Often, the door itself may have a rubber “sweep” at the bottom to keep water in the shower. Both framed and frameless shower doors have many options for style. Both can have glass that is frosted, patterned, etched, bronzed, or infused with Diamon Fusion to help keep them from becoming water-spotted. The biggest style difference is in the configuration of the enclosure. Framed showers are more limited in what the doors can do. Sliding doors are the most common type of framed shower, where the doors slide on a track. You cannot have a frameless sliding door. It is possible to have a framed door with an inset panel that opens and pivots in the frame and stationary enclosures with a heavy top frame. These become less common as the enclosure becomes larger. Frameless doors may come with a French opening that has two doors side-by-side that hinge 1 outward, or they may come in a variety of different stationary and moving panels that pivot and hinge 1 off of stationary panels. 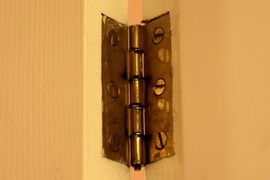 For example, a fixed panel may be anchored to a wall, and the door will hinge 1 off the panel. This construction means more glass, but it is necessary to provide a tight seal. It’s also easier to create custom looks with frameless doors including knee walls and three-wall enclosures of glass for an open, more minimalist look. It’s possible to find frameless splash panels or stationary panels without a moving door to contain some of the spray, without creating a barrier to entry. Both types of doors can provide a good view of the shower beyond. However, because of the heavy metal edge, framed doors are often considered formal or traditional in appearance, while frameless doors are more contemporary. Both framed and frameless doors should be installed by professionals. They can be stock items or custom made, depending on the size and shape of your shower, height of the ceiling, and glass you choose. Therefore, installation usually includes a template, or an exact measurement of your shower, made out of thin pieces of wood. These strips are then used as a map to create your door. The installation of a frameless door may be more labor-intensive than a framed door because the clips used to attach the door need to be perfectly level to prevent the heavy door from sagging over time. If tile is installed in the shower, then special drill bits are needed to attach the clips properly. 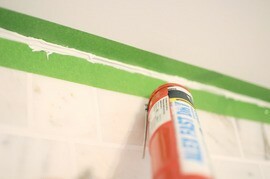 Heavy silicone caulk 2 is used where the glass meets the walls on stationary panels to prevent leaks. Framed doors may be slightly easier to install because the glass is thinner and the doors are less heavy. The frame makes the installation faster, as the glass rests on this rather than on a clip or hinge 1. Caulk 2 is still necessary to secure the frame and ensure that the glass is held properly in the frame. You can expect installation of frameless doors to take a minimum of three to four hours, while a framed door can usually be installed in about one to two hours. Keep in mind that if templating is done, then there is a lead time of two to three weeks between templating and installation of the doors. 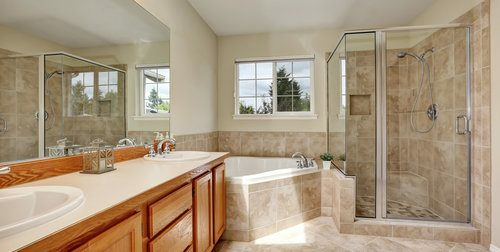 Costs of both types of shower doors varies tremendously based on whether the product is stock or custom, the size of the door, the height of the door, and the glass type. Because the doors are configured differently, it can be difficult to get exact comparisons for costs. In either case, opting for a custom door will increase both the material and installation costs. An in-stock, framed sliding shower door fitting a standard, 60-inch shower will cost around $200 to $300 for the doors. Installation runs around $100, for a total of $300 to $400. An in-stock, frameless shower door for the same 60-inch shower, using either a fixed frame and hinged 1 door or French openings, will cost between $600 and $800. Installation costs range from $300 to $400, making the total for this installation $900 to $1,200. The seal around any shower door may fail over time. This is unusual, however, and most reputable companies take extra pains to prevent this. Framed doors have a heavier barrier for water to penetrate because there is both a layer of caulk 2 and metal frame, so there is less chance of water leaks. A frameless shower will have rubber gaskets 3 and silicone caulked 2 edges to keep water out. However, rubber gaskets 3 crack over time, which can lead to leaks, but they can be replaced if necessary. Fixed panels with a door hinged between them will have a thick bead of caulk 2 at the corners to prevent leaks. The door will have mitered edges to prevent water from seeping out when shut. These types of improvements can help prevent leaks but will increase the cost of the door. The most common framed shower door involves a track at the top and bottom of the door. This track may collect water, which can lead to corrosion of the metal or growth of mold and mildew, which means they can be more difficult to clean. It’s also harder to find framed glass that has been treated to help prevent water spots, so we advise squeegeeing the door after each use. Frameless doors are less likely to contribute to mold and mildew problems because they do not collect water. They are also more likely to be treated with Diamon Fusion to help prevent water spots, making them easier to keep clean. There have been reports of both framed and frameless shower doors shattering, sometimes in the middle of the night when the door is not being touched or in use. These reports have been found with several companies, and although extremely rare, this is considered a drawback to any shower door. Shower doors are made of tempered glass, which means that when it breaks, it is into rounded pieces, not shards, so the risk of cutting yourself is reduced. The doors may break due to small cracks where they meet the frame or clips, improper transport or installation, or prolonged use. These reports are also rare, however, and the risks are minimal. Framed shower doors are more likely to collect mineral deposits around them and corrode because they are made of aluminum. Powder coating can help prevent this from happening, extending the life of the door. Frameless shower doors are less likely to develop this problem because less metal is used. Both types of doors can last 20 to 30 years or more when properly maintained. 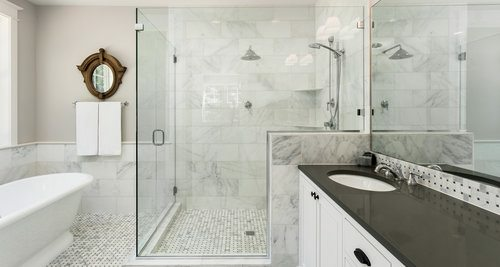 How much does it cost to install a framed or frameless shower in my city? Cost to install a framed or frameless shower varies greatly by region (and even by zip code). To get free estimates from local contractors, please indicate yours.